I had not felt the need of buying a hand cream separately until I shifted to Australia and experienced chilling and drying weather. Apart from that, lack of domestic help made me do all the house hold chores by myself and it made my hands really dry and devoid of moisture so after going to Australia I really started to hunt for a good moisturising hand cream to keep my hands hydrated all the time. 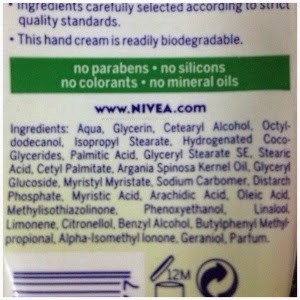 My search came to an end when I bought this super effective Nivea Pure & Natural hand cream. Packaging: The product comes in an off white and light green coloured opaque tube with a flip-top cover which closes securely with a click sound. The tube is made up of flexible plastic and it's easy to squeeze and use the last bit of product. Due to its gel like thick consistency you can get even a drop size amount without wasting it. I have never experienced any leakage while travelling with this product in my bag so it's definitely travel-friendly. 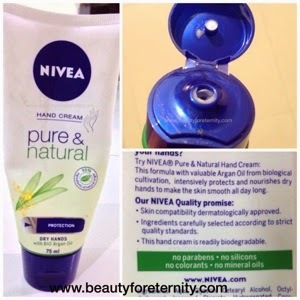 My Opinion: Nivea Pure & Natural hand cream is very light weight, non-sticky, lotion kind of cream with a pungent herbal fragrance which fades away quickly. 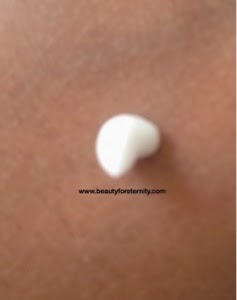 It spreads very effortlessly on hands and blends in without leaving any white cast or residues. It instantly makes my superdry hands look extremely moisturised and soft and improves their appearance right from first application. Another great thing about this product is that it is free from nasty chemicals and contains 95% natural ingredients so you don't have to worry while eating with your hands having this cream on those. The white streaky lines and tightness I feel after doing dishes and laundry at home gets relieved instantly. I use it at work too and never have any sticky feeling while working on keyboard, touch pad and my iPad. However it's pungent smell is little bit offensive for some sensitive noses. It's moisturising effect is not long lasting and I have to re-apply it time and again. I will definitely suggest you all to go for it unless I find a better option to recommend over this because it is by far the best hand cream for this price. I will recommend it to people who want to improve the appearance of their dry hands without spending much effort and money. However it is not a heavy duty cream and people with extremely dry hands might prefer thicker creams which are more efficient and moisturise deep down the skin and lasts longer. Score: This cream gets 3.5/5 from me.